The system will defeat itself. Nothing stays in a steady state. It overheats and melts. It only feeds itself the system. If you are using a mobile device to read this, the idea of a hyper-connected world is likely not new to you; the idea of a fractured world, on the other hand, may come as a surprise. Time spent on social media reveals fault lines linked to economic status, political views or cultural identity. You might also sense that misinformation online has surged. Although the corrosive impact of “fake news” is hard to measure, the feeling that we are more divided than united – locally and globally – nonetheless lingers. In fact, a relatively small number of big cities drove economic growth in the past two decades whereas, today, cities account for 80% of the world’s GDP. 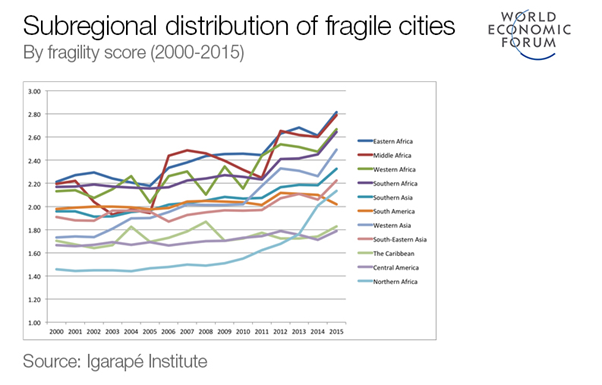 Yet new research is showing that cities (mostly in emerging economies) have also become more fragile in the past 15 years – and nearly two-thirds of the world’s population will live in one by 2030. The unsustainability of this demographic trend underscores why we need to think of a city as being a “system of systems”. And in this regard, Buckup’s salient observation is that when a system grows (i.e. scales), it does not necessarily maintain or repair itself along the way. As in nature, the size of the system may retard its rate of decay which is why bigger mammals outlive smaller ones. But the collapse of a system is rarely a linear occurrence but more often an exponential one – the death of a species (extinction) is nature’s example of exponential decay. We can see today that the balance of power between nation-states and the international framework that managed them in the last century is now frayed as protectionism, nationalism and xenophobia erode global solidarity. If complexity is at the root of a fractured world, then what can leaders do to change this? The first leadership requirement is to be able to differentiate between a complicated and complex system. Gilbert Probst and Andrea Bassi contend that this is a critical step in tackling complexity. Complicated systems, according to Probst and Bassi, “are composed of many different interacting parts whose behaviour follows a precise logic and repeats itself in a patterned way.” In contrast, complex systems “are dominated by dynamics that are often beyond our control.” What is common to both is that every system has a rationale and a purpose. We think of the transportation system with interacting parts to move people and goods – and depending on where you live, you expect it to function in a predictable manner. But in a complex system, the variables involved never work in exactly the same way each and every time. Complex systems, particularly of the socio-economic variety, exhibit unpredictable or uncontrollable behaviour. • A single breakdown of a transformer in a small electrical substation that leads to a massive disruption of an electrical power grid. • An illness in a remote locality impacting a few individuals is actually a new pathogen that could give rise to a regional pandemic. • A popular financial derivative (widely promoted to reduce risks) triggers a massive stock market collapse. The third requirement for a complex, fractured world is to combine the knowledge of complex systems with the practice of system leadership. All three dimensions of system leadership come into play if we accept the premise that the world is a complex, interconnected system. And further flows of goods, services, capital, people and data are the working assumption as the global economy appears to have entered into a strong cyclical recovery according to the International Monetary Fund’s outlook for 2018. Yet the risk of a fractured world remains because efforts to curb or curtail any one of these flows would have network effects that we cannot predict in terms of their impact.